The Milpitas Post reports that an alleged robbery and car theft that started on Sierra Road (that’s Sierra, not Serra!) in San Jose led to a police chase that ended when the suspect was apprehended at the dead-end at Railroad Court, at the northern end of Main Street in Milpitas. That happens to be where the Milpitas Post is located, so you could say the scoop landed on their doorstep. This funny little intersection is where Main Street crosses the railroad tracks, near Judge Weller‘s dairy farm. It used to connect with Milpitas Blvd and continue on to Mission San Jose and other East Bay destinations, but it was cul-de-sac’ed decades ago. If the suspect had been an avid consumer of arcane El Camino Real knowledge like myself he surely would have known this and not snared himself in the trap. Or perhaps that was exactly his problem; he was trying to flee to the mission for sanctuary and was following a really really really old map. Hopefully no one was seriously hurt (the police had to use a stun gun), property is rightfully restored, and justice will be served. Jane Stanford erected a monument to Serra at the Monterey Presidio, pictured above. This monument was placed in 1891, the same year she and Leland Stanford founded Stanford University. Stanford’s campus draws deeply from the California Mission tradition in its architecture and street names. Physically it is situated between El Camino Real and Junipero Serra Boulevard. I believe the Stanfords must have identified with the little Padre Presidente from Mallorca, admiring his piety, service, and dedication. 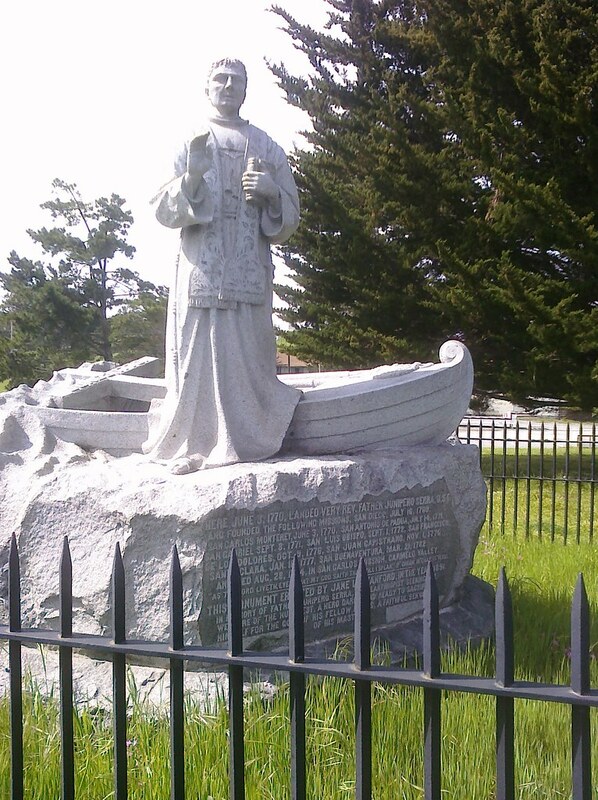 Junipero Serra died in Carmel at the age of 70 and is buried there today. Carmel was his final home, so his arrival and first Mass at Monterey on June 3, 1770 was especially significant. In many ways it was the start of a new life for him in Northern California. This date is significant to me also as it’s the day I married my lovely wife, Paulette. Our wedding was June 3, 1995225 years after Junipero Serra’s Monterey Mass. That makes today our 15th anniversary. I’m deeply grateful to her for all the support and understanding she’s given me, especially since I undertook this All Camino project last year and let it lead me all kinds of crazy directions. She’s been very kind about keeping the eye-rolls to a discreet minimum every time I come running to her with some obscure map or historical tidbit or duplicate book purchase. And as she’s one of my most faithful readers, this is for her: Happy anniversary, Honey! I love you! You are currently browsing the All Camino blog archives for June, 2010.